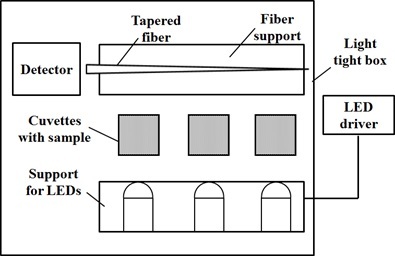 Using its patented technology, Science & Sensors Technologies, S&ST, developed, and is commercializing, a new optical fiber colorimeter to simultaneously measure the concentration of different chemical concentrations in water (see Figure 1). This device can determine the concentration of chemicals in multiple samples, using a single detection system, significantly reducing the cost of performing these measurements. 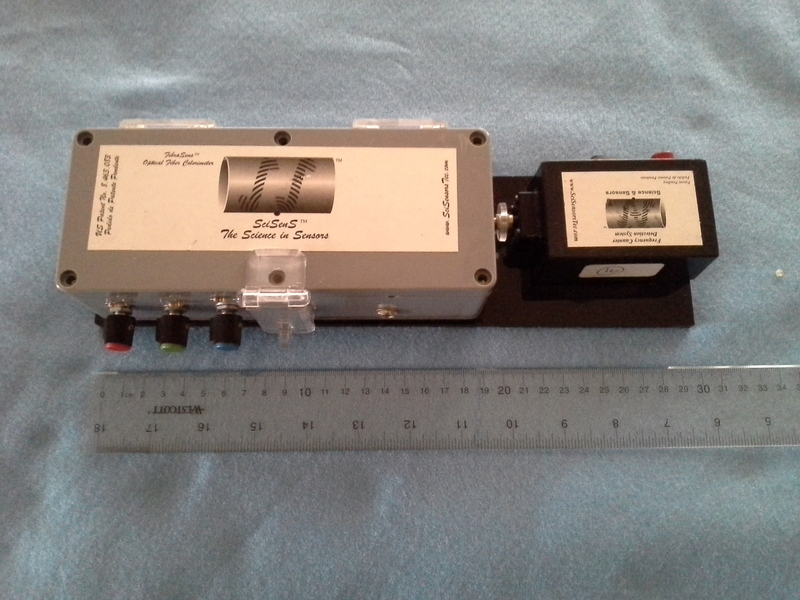 With this apparatus, measurements can be made using absorption, fluorescence, scattering and reflection from the sample. An illustration of this device is shown in Figure 2. The current device uses three LEDs, bottom of the illustration, to illuminate three different cuvettes with liquid samples. By removing the cuvette samples, this device doubles up as a Planck constant experiment apparatus. This is done by determining the knee voltage of different LEDs and using the peak wavelength of the LEDs and the equation for energy conservation. Each colorimetric box has up to three LED light sources with peak wavelengths that vary from that 370 to 940 nm. (*) Please, specify your wavelength region. We also make offer colorimeters white light sources that span the full visible spectrum. (*) Custom made devices that handle more than three cuvettes samples and have more than three light sources can be ordered.